Last week I was shopping at Grossme Outlet. (That’s what a friend of mine calls Grocery Outlet since they carry a lot of overstock stuff, close-dated food items, etc. It made me laugh, so the name stuck despite the fact that I adore G.O. for their usually low prices and weird selection. I save hundreds of dollars every few months by shopping there as one of my go-to stores. Literally.) While I was shopping, I spied a shelf of sneakers for sale. They were originally priced at $29.95 and were marked down to $14.95. I have no idea what the manufacturer’s price was, but the $29.95 is what G.O. was originally charging. These sneakers were the kind of walking sneakers that have the sort of rounded bottom so that you don’t really strike on your heel, but more on your mid-foot and the ball of your feet when you walk. Mine are a lot like this. Only black. Note the rounded heel and the sloped front of the shoe? Walking in them is like walking with rocking chairs strapped to my feet. Examining the shoe, I wondered whether my extreme supination problem with my left foot would be much of an issue. I mean, if I’m not landing on my heel with each foot fall, how can I supinate? Out of curiosity, I tried a pair size tens on. Now, I’ve posted in the past about how I have gargantuan duck feet requiring a 4E width before. These shoes looked fairly wide, even though they weren’t marked 4E or 2E or even W, as some wide shoes are marked, so I thought I’d try it anyway. Lo and behold, they fit. Even better, the shoes had plenty of room in the toe box. No pinching at all. Next came the walking around test. Would my left foot strike down all wonky? Well, yes, it did. Sort of. Both feet struck down wonky. In fact, walking in the shoes at all was….wonky. I felt like I had rocking chairs strapped to my feet. But they were very cushy and comfortable rocking chairs. At $15 a pair, I thought, why not experiment? I bought two pairs. One has a much thicker sole than the other, and both fit fine. I’m curious what the difference in the sole will make while walking but I’ll find out. All weekend, I’ve been breaking in the black pair, walking a mile here and there, running errands and such. My left foot, in particular, was fairly sore. But, over the last few days, the soreness has been less and less until today I felt confident enough to try a middlin’ walk. I walked 5.2 miles in them. My feet actually feel pretty darn good. No more sore than they would feel in my other shoes. And the rocking chair effect isn’t hardly noticeable anymore. I’m pretty used to the way the shoe feels now. My only cause for concern so far is that the right shoe rubs the back of my ankle. You know the pointy part of the back of the shoe that cups over the top of the ankle bone? It was rubbing the snot out of my achilles. I’m glad I had the sense to put some moleskin on first, or else I might have a nasty blister. I think I can break down that pointy part of the shoe, though. I plan on stopping by a cobbler this week and asking the best way to break that part of the shoe in so it doesn’t rub anymore. Because if that is the worst problem I have with these shoes, and it is a fixable one, I’m going to go back and buy up all the rest of the shoes in my size that I can find. I figure this walk will take me at least 5 and probably 7 pairs of shoes. 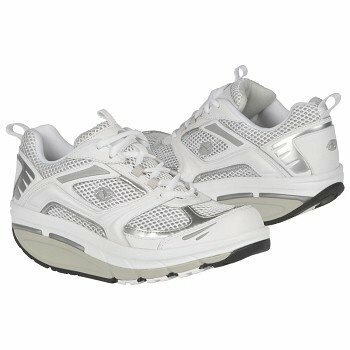 My other shoe, which is $159 for the new model and about $100 for the old model (if I can still find it) will cost me between $500 and $1000 to replace for the entire walk across America. If I can buy 7 pairs of shoes for $105 total, that would just make my day. But, I’m not allowing myself to get too excited yet. First of all, I have to see how well these shoes work with distance and how well my feet handle them over the next couple of weeks. And, of course, by the time I finally decide yes or no, they may be gone! It’s Grocery Outlet, after all. Very little is ever guaranteed to be there the next time you go for a visit. I checked to see if I could find these shoes online anywhere, and the shoes I’ve got pictured above are the same brand (I think) and are on Amazon for $93. So it won’t be likely. I’m torn whether I should go ahead and buy a couple more pair for just in case they do work and they won’t be there….But if they don’t work, that’s $30 that could have been put toward my standard shoes. I just saw those shoes when I was at Grocery Outlet here in Albany tonight! Well, I saw the sign outside for them, I didn’t actually take a look at the display cuz I forgot to by the time I went inside the store. But I have heard mixed reviews about the efficacy and safety of that style of shoe. You may want to check out articles on them before you decide to buy stock in them. I am not saying they are bad, by any means, merely playing devil’s advocate. Love ya! Hiya, T! Yeah, I’ve read mixed things about them myself. Some say they are wonderful and do good things, like align your body properly, etc. etc. and I recall seeing somewhere (I don’t remember where) that they can actually do some damage. I also remember reading that with this style of shoe (just like with the five finger shoe) you have to start a little at a time and not over do it, otherwise that can cause injury, too. So, I did that. A little at a time for the last few days. I’m hoping it all works out. But if it doesn’t, at least I will know that for the future! I just bought a pair at GO here in Hillsboro and found your blog when researching opinions lol so Hello new neighbor 🙂 (I just moved here from Las Vegas a month or so ago). I personally like these shoes – they force me to walk heel-toe, something I have had a problem with since breaking my left ankle; having now broken both ankles makes walking in rain (does it EVER STOP HERE? LOL) a bit challenging for me and my feet have been in pain for about 2 weeks. I noticed that these shoes seem to take the stress off the arches of my feet and the ball of my foot feels much better. Perhaps someone with a ‘normal’ foot would have a hard time with them or sustain damage, but I feel they are really helping me at this point. I also noticed a side benefit; I have had balance issues for years since breaking my right ankle, and the interesting sole shape REALLY makes me work on balancing. I can feel muscles engaging to keep me from falling that I haven’t felt in years and my balance is improving. Only a few days so far, but I have been VERY active and this is a really noticeable improvement..
I’m glad to hear another person has had some luck with them. I find I really like walking in them, but I’ve noticed that with my black pair (which has a much thinner sole than the silver pair) the left foot is already starting to roll a little due to my extreme supination. So frustrating. So I’m monitoring that closely. They are super comfy, though, and I will be sad if I can’t use them for the long haul.